Home » The Organized Walnut » get organized! Today, I hit the jackpot: I found the one thousandth crushed Cheerio in the bottom of my purse. (Frankly, after 5+ years of motherhood, I’m surprised there weren’t more!) If your bag has become a bottomless pit and plays home to one too many broken crayons, used tissues and lollipop wrappers, you know that trying to locate your car keys can sometimes become a game of hide-and-seek. 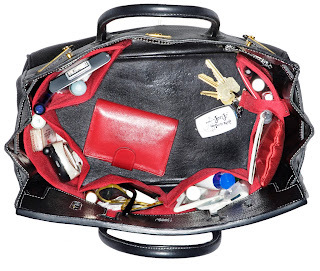 The Ultimate Purse Organizer seeks to put an end to that type of frantic searching once and for all. Now before you say it’s not for me, consider this: this organizer is interchangeable and can be used to fit any medium- to large-sized handbag or tote. The six pockets provide ample room for your cellphone, keys, Chapstick and oh yes, a stash of lollipops. When you’re ready to change bags, simply remove it and pop it inside your new bag of choice. No need to weed through everything, and your necessities remain contained in the proper place. In a Nutshell: This purse organizer will be the envy of your most anally retentive mommy friends. And now you’ll finally be able to get your hands on those gift cards before they expire.